This module introduces you to ASP.NET 4.5, including web page applications, web forms applications, MVC applications, and shared ASP.NET features. 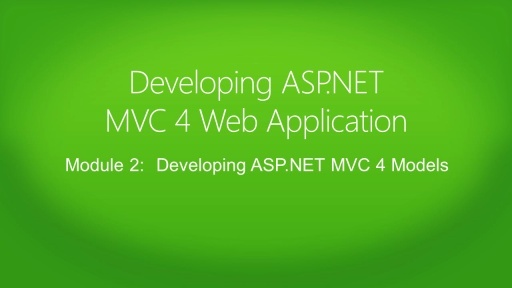 It also introduces the main features of ASP.NET MVC 4. Both guys explanation were very clear, I also joined that event. Jon Galloway and Christoper are really excellent talk. that 'yup' is kinda annoying. Excellent Training... You guys are great trainer... I learn a lot from the video series... Thank you guys! "relatively natural transition" - what he means is it is a natural technology transition, but it is difficult, I've never met a Web Forms developer who can quickly get productive with MVC. Maybe those that "get it" actually quickly make the transition and deny any knowledge of Web Forms after that point and the others "just don't get it"
@Niner87734: I agree and I'm not sure if I can bare to watch any more of the videos unless he stops it. I'm addicted to your Training.Thanks Harrison & Jon. Excellent collection of videos on MVC4. thanks for presenting this material. Scott, you have to stop with the "yup" thing. it is REALLY annoying and adds no value to the videos. Unfortunately, once a viewer notices this, it almost makes watching the rest unbearable, which is a shame given the great material covered in these videos. Please re-think your no-value dialog and stop with the "yup" every few seconds. ^^^ and by 'Scott', I really mean Christopher. Sorry about that. the tow guys are verry excelent trianer i learn alot from ur presentation!!! Can anyone provide the source code for these videos? Its awesome.Can you please provide me the material for this? You guys talk toooo much... and less project demos..